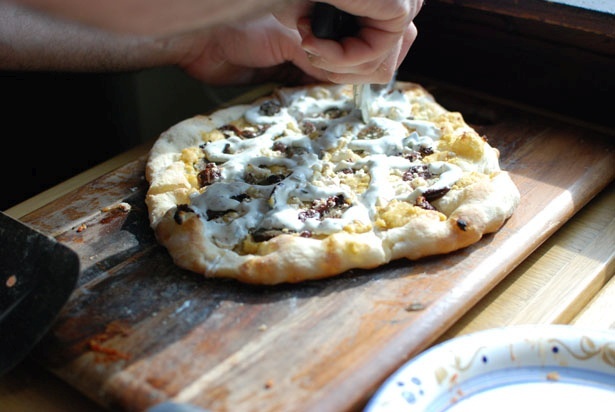 Did you guys know that hummus makes an awesome alternative to pizza sauce? 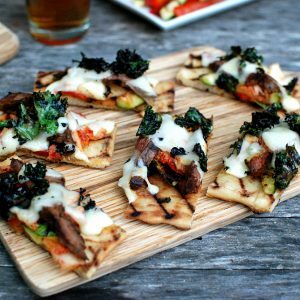 I used it on pizza at a recent pizza party, and a few people even called it the best pizza there! 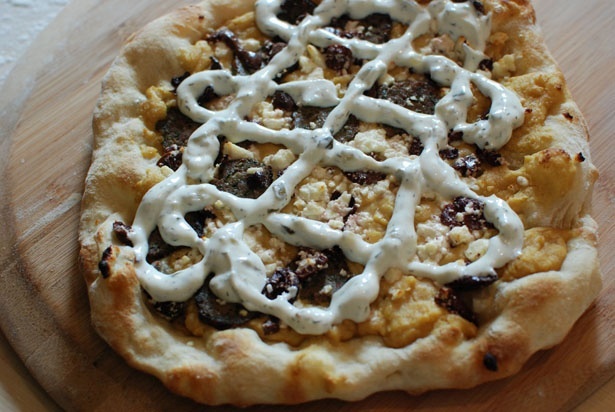 I decided not to get weird with the flavors like I did yesterday, instead I just topped the pizza with some of hummus's best friends. 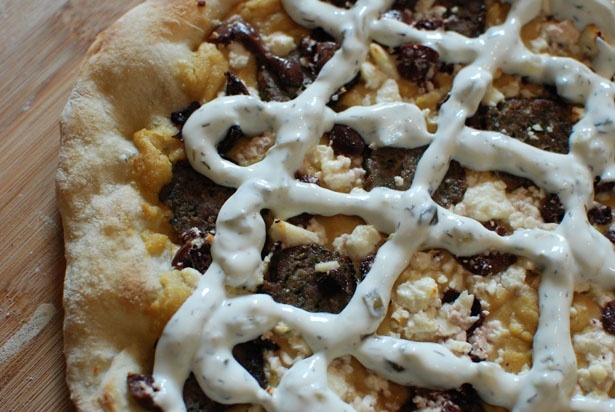 Friends like feta, olives, kofta, and tzatziki. First I made the kofta. Just a quick meatloaf mixture. Pop them on the grill. Later at the party... Hummus goes on first. Sabra of course! 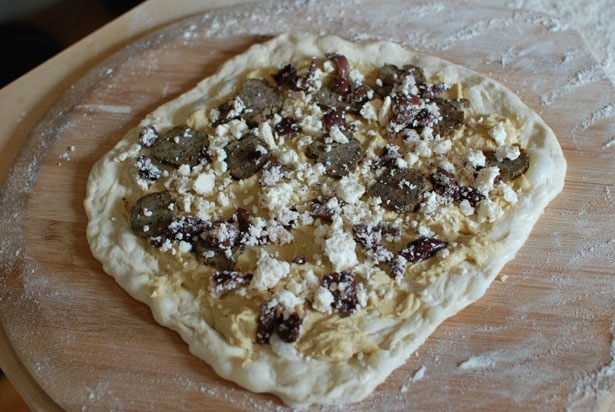 Then the sliced kofta and the feta and olives. 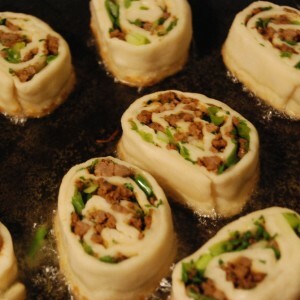 Get it in the oven! Thats a good lookin pie! 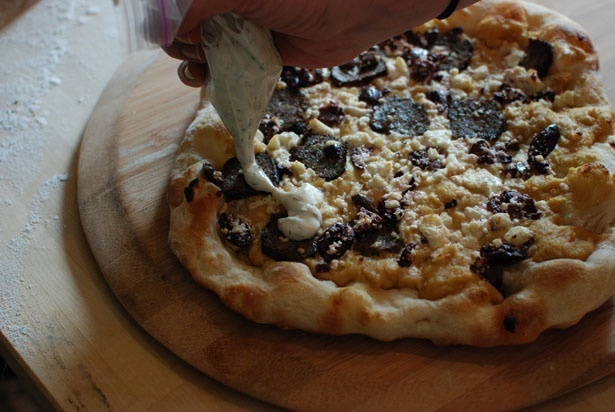 Pipe the tzatziki onto the pizza. We actually used the Sabra cucumber yogurt dip for this. Perfect. 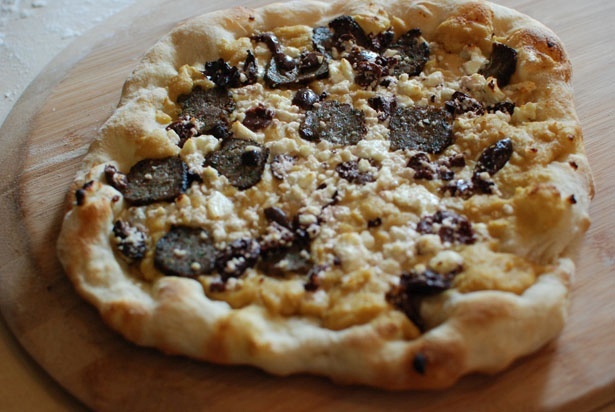 The flavors on this pizza were perfect and all the different ingredients were well balanced. Customary slicing. 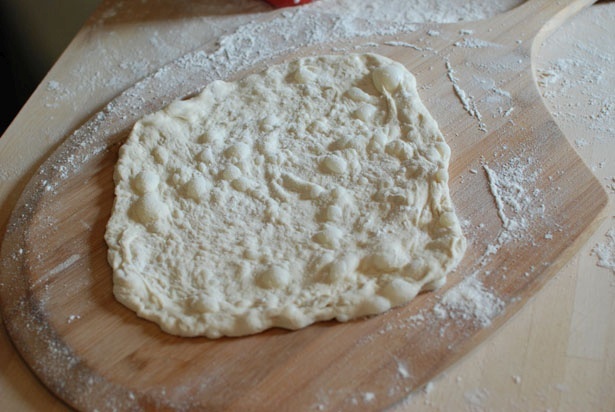 Check here for info on pizza dough. 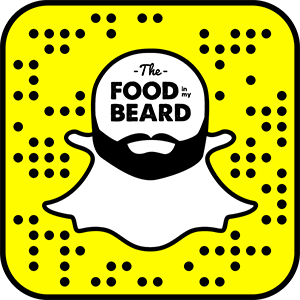 Look here for tips on making tzatziki. 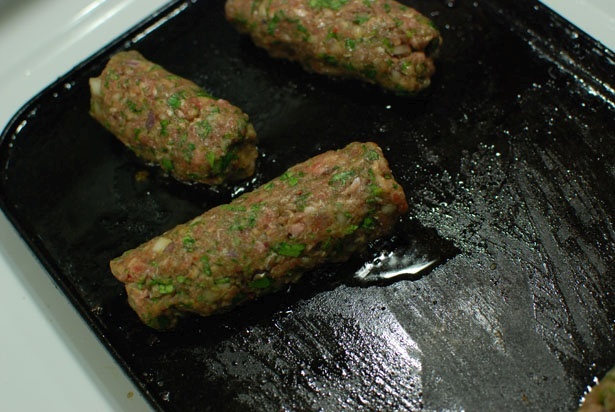 Kofta was 1 pound ground beef, a solid half cup each of mint and parsley, 2 garlic cloves, 1/2 a red onion, a tablespoon of paprika, 2 teaspoons cumin, and salt and pepper. Mix and allow to marinade an hour before grilling in log shapes. Slice into thin rounds. 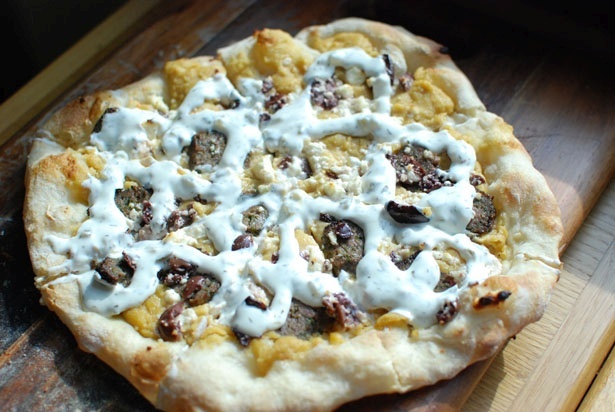 The pizza was topped with Sabra Classic hummus, olives, feta, and kofta before being cooked, and finished with Sabra Cucumber Dill veggie dip after cooking. 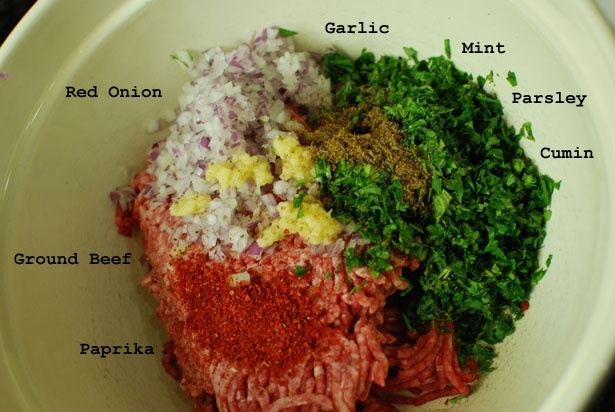 It looks like you missed one of the kofta ingredients (the brown powder beside the garlic). Is that cumin? 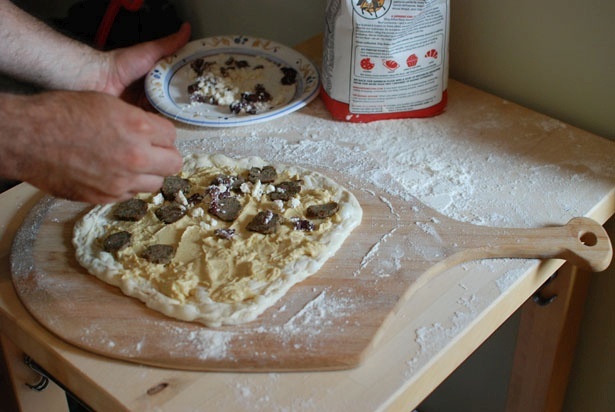 Also, is that regular pizza dough, or is it some form of pita? Thanks! 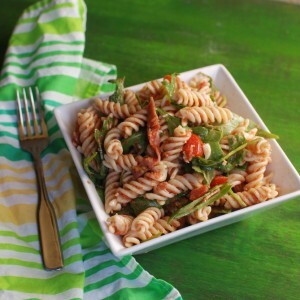 I adjusted the picture and recipe to reflect the cumin that was missing! 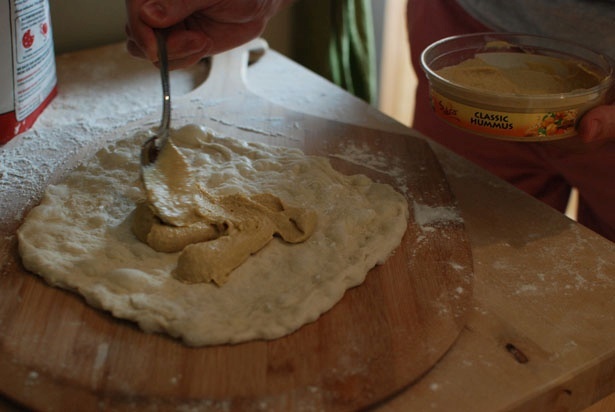 As for the dough, it was just regular old homemade pizza dough. This looks and sounds AMAZING!! Just want to check on the baking procedure– how hot an oven and for how long? Did you pre-bake the crust at all? I’ve never heated hummus before, so I don’t want to burn or melt it, or wind up with soggy crust…. Thanks! !